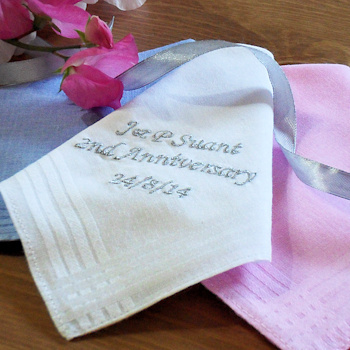 Ladies single personalised handkerchief embroidered with monogrammed initials, a name or little message as you wish. We offer a standard ladies white cotton handkerchief OR you can select from the fabric options a ladies cotton with floral lace trim handkerchief, a blue cotton hanky, or if you require a more luxurious fabric we offer a white Irish linen with floral lace trim handkerchief each as an upgrade option. Just fill in the option box and choose what colour embroidery thread you would like us to use. Just fill in the option box and choose what colour embroidery thread you would like us to use. We can embroider in print or script. Make someone very happy with a unique gift dedicated to them. Please allow at least 3 days for personalised orders to be dispatched as they are handmade to order by Amys Gifts.